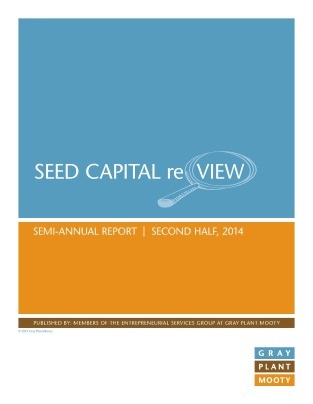 We just released our Seed Capital reVIEW report analyzing seed and angel capital raised by early-stage companies in Minnesota during the second half of 2014. I know, the first half of 2015 is already over—what took us so long? You may or may not be surprised to learn that, for a bunch of lawyers trying to get information about financings from a bunch of busy CEOs and CFOs, it takes some time. As you may recall, Seed Capital reVIEW is our attempt to compile data regarding what types of companies are raising early-stage capital in Minnesota (typically between $100,000 and $2,000,000) and the terms relating to that fundraising activity. Not surprisingly, as in past survey responses, most of the companies raising capital identified themselves as being in the Medical/Healthcare (with 30% of respondents indicating they are involved in the sub-category of healthcare IT), Cleantech/Biotech, or Technology spaces. Only 24% of respondents utilized MN Angel Tax Credit, likely a reflection of the limited available credits during the second half of last year. Two-thirds of respondents reported offerings structured using equity (60% common equity and 40% preferred equity), with debt securities comprising the remaining third. Participation rights in future investment rounds. In preferred equity deals, 80 percent reported a 1x liquidation preference. A board seat or board observation right. Almost all respondents again reported debt with an initial term of at least one year. A majority of respondents reported receiving rights to participate in future financings. Almost 82% of debt-structured offerings were convertible to company equity. Please look for our call for survey responses for capital raised during the first half of 2015 soon. If we can get our act together (no promises) and get quicker responses, we may even be able to publish the next report before Santa hitches up his sleigh this winter!